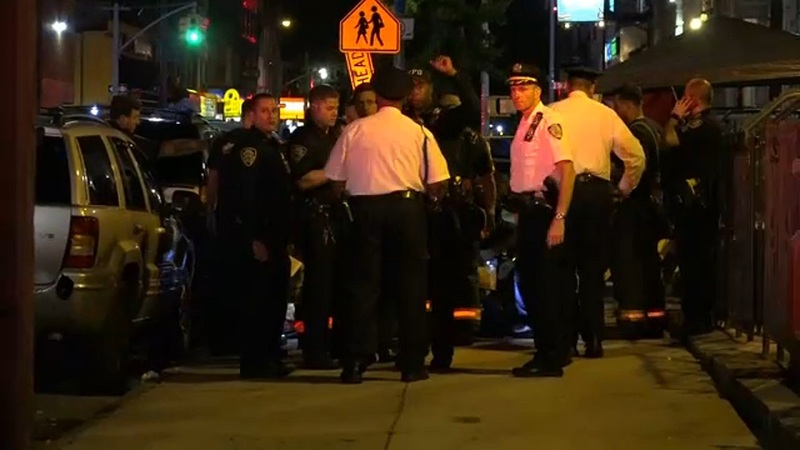 CROWN HEIGHTS, Brooklyn (WABC) -- One person was killed and three others wounded in separate shootings in Brooklyn Sunday night. Two people were shot a block off Eastern Parkway in Crown Heights. The other, a 38-year-old man, was shot in the torso and arrived at Kingsbrook Jewish Medical Center. Also, a 44-year-old man was shot in the chest in Crown Heights, just blocks off the West Indian Day Parade route. The man was shot on Sterling Place, three blocks north of Eastern Parkway, just after 11:15 p.m. by a gunman dressed in black who opened fire and fled on foot. The man was taken to Kings County Hospital in critical condition. No arrests were immediately made. Earlier, a 49-year-old man was fatally shot on Herkimer Place in Bedford Stuyvesant, Brooklyn - further north of the parade route. The man was shot in the head just after 8:45 p.m. Sunday night and pronounced dead at Kings County Hospital. Police said that shooting didn't appear to be connected to the upcoming festivities.